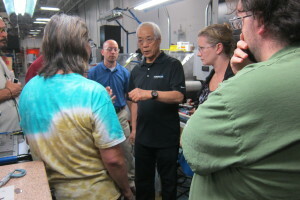 This is a rare opportunity to learn genba kaizen from Chihiro Nakao, perhaps the world’s greatest industrial engineer. Nakao-san has more than 50 years of genba kaizen experience. He is an amazing teacher and an inspiring leader who has spent the last 28 years teaching genba kaizen to people all over the world. His tireless efforts and the dedicated work of his students has led to remarkable improvements in hundreds of organizations, both large and small. Some examples include The Wiremold Company, Virginia Mason Medical Center, Danaher Corporation, Boeing, and Amazon. You should never miss a chance to learn from Chihiro Nakao. You could roll up all the Lean big-shots into one and you would still learn more from Nakao-san. Whether you are the president of the company, HR manager, supervisor, or engineer, you will learn the genba kaizen method by which all other kaizen is compared. Space is limited to 50 people, so reserve your space now. Click here to read the invitation and program, and for points of contract in the U.S. and Japan to obtain additional information. *I have no financial or other interest in this workshop, and I am not affiliated with Shingijutsu USA. I am simply a friend of Shingijutsu: Bob Emiliani, FOS.